(leading to ExpertRating Computer Networking Training Certification-Introductory). Upon completion of the course, you will be capable of performing basic computer networking tasks, such as DSL connectivity or configuring connections to an Internet Service Provider. This course will give you the foundation you need to begin training for CCNA Certification or employment in a computer networking career. This course includes a knowledgeable and caring instructor who will guide you through your lessons, facilitate discussions, and answer your questions. The instructor for this course will be David Iseminger. About the ExpertRating Online Computer Networking Course-I instructor :David Iseminger is a computer and networking expert and an experienced teacher of networking topics. As a student first and expert second, Iseminger knows which teaching approaches are most effective. Iseminger has worked at Microsoft Corporation as a telecommunications specialist, networking performance analyst, and lead programming writer for cutting-edge network disciplines, including emerging wireless technologies. Iseminger has published 12 computer books with various publishers, including John Wiley & Sons, Macmillan, Microsoft Press, and one ...for Dummies book. His formal education is from the University of Washington where he earned degrees in English and Comparative Literature with a minor in writing. Iseminger earned his MCSE certification in under a month. Online Computer Networking Course requirements: For taking this instructor led ExpertRating Online Computer Networking Course-I you need Internet access, e-mail, and the Microsoft Internet Explorer or Mozilla Firefox Web browser, and a computer equipped with Microsoft Windows 95 or newer. "David Iseminger is an excellent instructor!! Wouldn't hesitant to take any class he would teach and also wouldn't hesitate to recommend him to others. He knows how to simplify complicated material to make it comprehensible and understandable, he answers questions and makes you feel that no question is out of bounds or silly or out of place, is extremely warm and friendly, makes one feel very welcome in his class, writes his lessons with clarity and coherence, using very familiar analogies that gives one a clear picture of complex material (I bet there is a poet in him). His class was over much too fast, it was so enjoyable and instructive. David never showed impatience with anyone, made you feel he could learn from you too which was so refreshing. I learned more than I ever thought I would in such a class, way more, and am also inspired and encouraged to learn much more on the subject. It is instructors like David who will keep me taking online classes. The class was extremely worthwhile and one that will stay with me. Thanks!" "David Iseminger (the instructor) writes amazingly clearly, and he manages to find accurate analogies to help explain nearly every concept in the course. The lessons and chapters are organized logically, and concepts are explained fully yet succinctly. Furthermore, the material is explained in a way that makes it downright interesting. Highly recommended for anyone interested in learning about computer networking." "David: This was a GREAT course, and EXACTLY what I needed. Thanks for a great job you did. EVERYTHING about this course was simply superb - the format, the content, the materials, the way things were presented, etc. etc. I liked your style and material so much that I feel I could learn a lot from you." "Excellent course content, good analogies and examples. Explained in an easily understood manner. Content was perfect for an introductory course." Excellent course. Lots of information was provided, however it was a very easy-to-follow format and it was kept interesting." "Excellent use of illustrations as a means of clarifying initially difficult concepts. Very clear writing style. I also enjoyed the humor. Overall, an excellent course." "Finally, someone who completely understands his subject and is capable of conveying that understanding to others. This course met the criteria for effective teaching: Explain clearly, Illustrate and show practical application. I will be back for more!!!" "Great class. Loved your teaching method. I hope to have you as my intermediate professor." "Great course!! Look forward to the Intermediate. I learned a lot." "Great refresher course. Look forward to doing the intermediate course starting in November. Thanks." "I absolutely loved this class. It's everything I hoped for and more. I would like to take an advanced class from this instructor in the future." 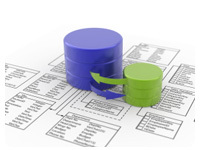 ExpertRating is one of the world's only ISO 9001:2015 Certified companies (from TUV America) offering an Online Computer Networking -I Course (leading to ExpertRating Computer Networking -I Skills Certification). When you choose the ExpertRating Online Computer Networking Course-I you can be sure that you are buying a premium International certification that is recognized by hundreds of employers and Government bodies in the US and other countries. With ExpertRating you get certified quickly online and you are equipped with a store house of information through the in-depth ExpertRating Online Computer Networking Course-I Courseware which has been developed by experienced Networking and Security Experts. 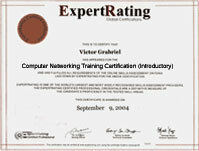 The ExpertRating Computer Networking Certification is by far the best value for money instructor led Computer Networking Program at $129.99. How much does the Computer Networking Certification cost and what does it include? You can buy this ExpertRating Online Computer Networking Course-I leading to Computer Networking certification at a special offer price of only $129.99 which includes the in-depth ExpertRating Online Computer Networking Course-I Courseware and exam fee. This is the best value for money Computer Networking Program available till date. You get the following services within the USD $129.99 fee. In-depth ExpertRating Online Computer Networking Course-I Courseware including scenarios and case studies. World wide airmail delivery of the hard copy Computer Networking Certificate. The Computer Networking Certificate can be used to prove your certified status and does not mention the words "online". The process of getting yourself certified is very simple. All you have to do is buy the ExpertRating Online Computer Networking Course-I for $129.99. Log in to the instructor led course using your password. Go through the ExpertRating Online Computer Networking Course-I Courseware (which would take you 6 weeks) and complete the final Computer Networking Certification exam at your convenience. You can complete the exam within 2 months of buying the Computer Networking Certification. The result of the exam appears as soon as it is completed, and your Computer Networking Certificate is mailed immediately. Chapter assignments to help you practically use the Computer Networking that you will learn during the Computer Networking Course. The final exam is fully based upon the ExpertRating Online Computer Networking Course-I Courseware that is provided along with the Computer Networking Certification. If you have gone through the courseware properly you should not have a problem clearing the exam. The exam consists of multiple choice questions from all chapters of the ExpertRating Online Computer Networking Course-I Courseware. Networking can help you increase business productivity and improve the skills of your employees. Networking is the method by which two or more computing devices can be linked together for the purpose of sharing data. Networks are developed by mixing computer hardware and computer software. Networking can help you to reorganize the office, share music files and printers. The Networking course will provide you tips and give a comprehensive understanding of the tools and techniques which will get you started with setting up a network. There are two kinds of network available; wired networks which use Ethernet (CAT-5) cables to connect to networked components and wireless networks which use Wi-Fi which is a wireless communication standard. The ExpertRating Networking Certification will help you easily set up a network at home, in the office or in schools. Have you ever wondered how networks started? You're surrounded by networks, whether they're computer networks, networks of roads, or the network of telephones that allow you to communicate every day. In this first lesson, you'll learn how networks have evolved over the last hundred years. You'll also find out why every additional device that connects to a network greatly increases the value of the network. By the time you've completed this lesson, you'll have a framework of knowledge that will take you through the rest of the course. In this lesson, you'll jump right into networks and networking, and learn how they work. You'll use examples from your everyday experience. You'll learn how to tell the difference between a network and networking, and realize that computer networks are a lot like freeway networks. You'll never look at an interstate the same way again! You'll also find out why shipping your data from one computer to the next is a lot like sending your distant uncle a new coffee mug for his birthday. Believe it or not, freeways and shipped gifts have a direct correlation to how networks and networking operate! Have you ever heard someone refer to a computer as a server? Maybe you've heard someone talk about connecting computers in a peer-to-peer environment. Understanding the difference between client/server and peer-to-peer networks really helps you learn about computers and networking. So in this lesson, you'll learn how to tell the difference between client/server and peer-to-peer networks, and when to use one instead of the other. Many people have heard of Ethernet, but what does that mean exactly? In this lesson, you'll learn all about Ethernet, and a whole lot more. Here you'll find out the difference between a star topology and a bus topology, and the advantages of each. Is Ethernet or Token Ring the best modern network technology, and why? In this lesson, you'll get those answers and many more! This lesson will explore how routers operate, and you'll see why routers operate a lot like how a receptionist in a growing company handles telephone calls. This lesson will build on information you learned in previous lessons, then you'll find out how a single interconnected network (the Internet) can actually span the entire globe. A global network is an amazing feat, accomplished by interconnecting network segments and routing data! When you've completed this lesson, you'll understand how routing helps data to cross the city, state, or an entire ocean. When people communicate, they speak a language—such as English—to exchange information. Computers communicate similarly over a network, but instead of speaking a language, they use something called a protocol. Protocols are similar to languages, and in this lesson, you'll learn about the protocols used in networking. You'll also learn which protocol has emerged as the dominant computer protocol, and why! In this lesson, you'll learn how the networking protocol TCP/IP operates. TCP/IP is a collection of protocols, and in this lesson you'll learn how TCP/IP divides its tasks. This lesson will go over how TCP/IP uses addresses to direct data to its rightful owner—it's similar to how people use street addresses. Have you ever wondered how your computer converts a World Wide Web address into a Web site that appears on your screen? In this lesson, you'll learn how the Domain Name System (DNS) translates names into numeric addresses, and how all that allows your favorite Web site, e-mail, or file to appear on your computer screen. You'll also learn how the entire computer industry comes to a consensus about how the Internet should work. This lesson will take a look at Wide Area Networks (WANs) and how they compare to Local Area Networks (LANs). You'll learn all about how data gets sent over long distances, and how the Internet changed expensive, long-distance network connections. 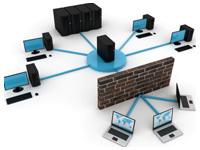 You'll also learn how Point-to-Point Tunneling Protocol (PPTP) secures those Internet connections from prying eyes. If you connect to the Internet, you use remote access. This lesson will explore the traditional means of connecting to remote LANs, and talk about exactly how dial-up Internet access works. Then this lesson will discuss modern means by which many people connect to the Internet, including DSL and cable modems. In this lesson, you'll apply many of the concepts you've learned so far in this course. This lesson will walk through the process of making an Internet connection, and you'll see the step-by-step process of creating a dial-up connection. Each step of the way, you'll come to understand what's going on behind the scenes. From there, this lesson will jump to connecting to the Internet using broadband connections, such as DSL or cable modems. This final lesson will tie all the previous lessons together, clarifying how new information about networks and networking can be quickly understood. You'll learn three categories into which networking knowledge can be placed, and see examples to apply your newfound network categories. By the end of this lesson, your understanding of networking will be solid as a rock, and you'll be well-prepared for a lifetime of continued learning about networking!